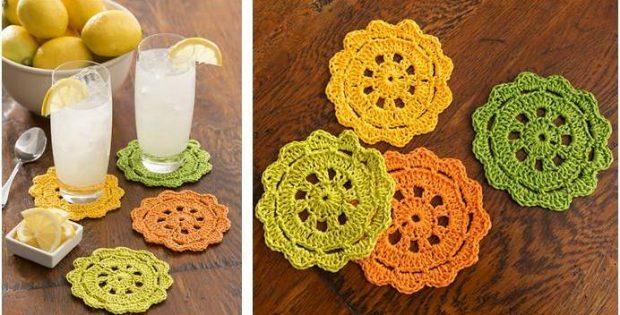 Beautify your home with these pretty crocheted coasters. The colorful crocheted items will definitely brighten your abode. They make for a really presentable accessory when entertaining guests. They also make for a truly excellent housewarming present! In fact, this pattern is an ideal project for people with intermediate crochet skills. They will definitely enjoy working on these fun and rewarding pieces. Once finished, the crocheted coasters should measure approximately 4.75 inches in diameter. In metric measurements, each completed crocheted coaster should have a diameter of roughly 12 cm. This crochet pattern is a wonderful design by Michele Maks. In fact, you can access the FREE downloadable pattern for these bright crocheted coasters from the Red Heart website. To access the FREE downloadable pattern for these summery crocheted home items, please click on this link: Pretty Coasters Crochet Pattern.